I like to keep frozen salmon on hand. I generally purchase the fillets off the Schwan’s truck, but you can also grab them in the freezer section at Walmart, Target and most grocery stores. There really are many easy recipes for salmon on the grill, in the oven, on the stove top and even in the crockpot. I love that it cooks fast. Ready for a super easy recipe? I like to line a cookie sheet with parchment paper, makes clean-up a breeze. Place your salmon fillets on the cookie sheet. I generally thaw them before cooking, but if they are frozen just increase your cook time by 10 minutes or so. 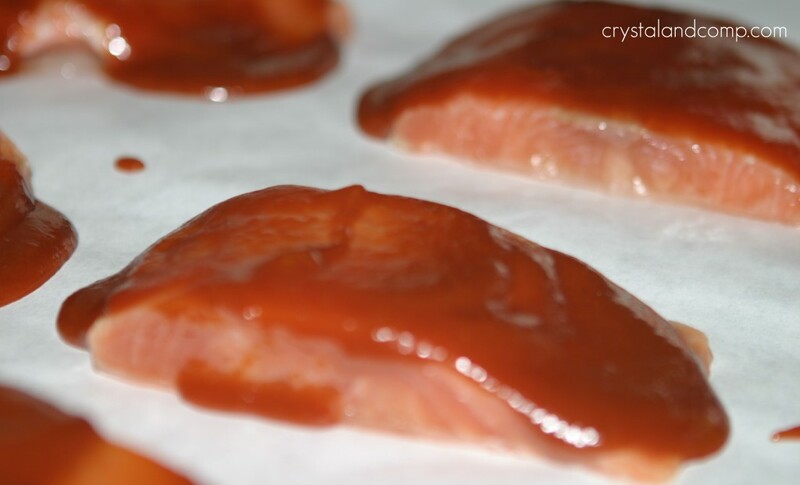 Use a spoon or a brush to coat the top of each fillet with BBQ sauce. Pop them in a 350 degree oven for 20-25 minutes depending on how done you like them. We like well done. We like to serve with rice or couscous and a dinner salad. Is that easy or what? Perfect for a busy school night when you did not get dinner in the crockpot. And if you’ve never had couscous, it cooks really fast- 5 minutes. This is the perfect dinner for a busy school night when you forgot to throw something in the crockpot. 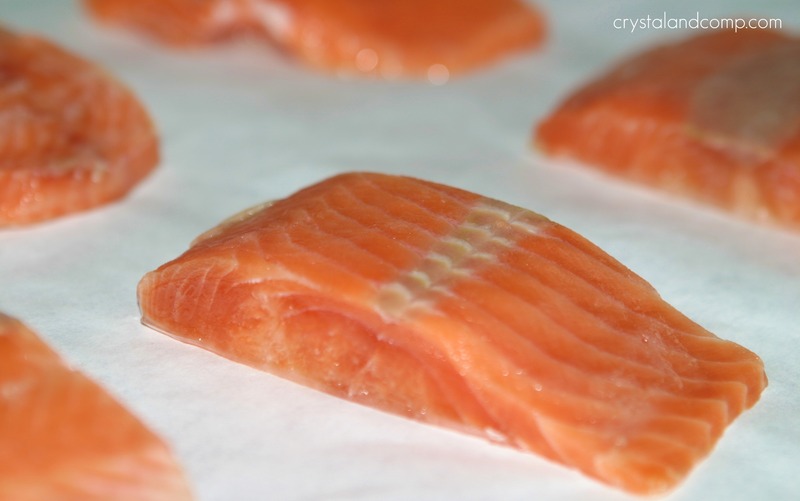 Place your salmon fillets on the cookie sheet. I generally thaw them before cooking, but if they are frozen just increase your cook time by 15 minutes or so. Plate them up. We like to serve with rice or couscous and a dinner salad. Crystal & Co., has tons of easy recipes that are perfect for a busy school night. I love salmon too. Definitely my fish of choice. This recipe looks delicious! This just looks amazing!! This is my first time on your blog, I have to say, I really love your header! Awe, thank you Jenn. I am so glad you found my site. The salmon is awesome and easy! Give it a try. Aldi carries Salmon. Ya know, I have never been there, but really need to go. I have a good friend that loves that store. Yes, parchment paper is a staple at my house. This looks and sounds so yummy! Another great recipe to add to my list! Thanks for sharing! 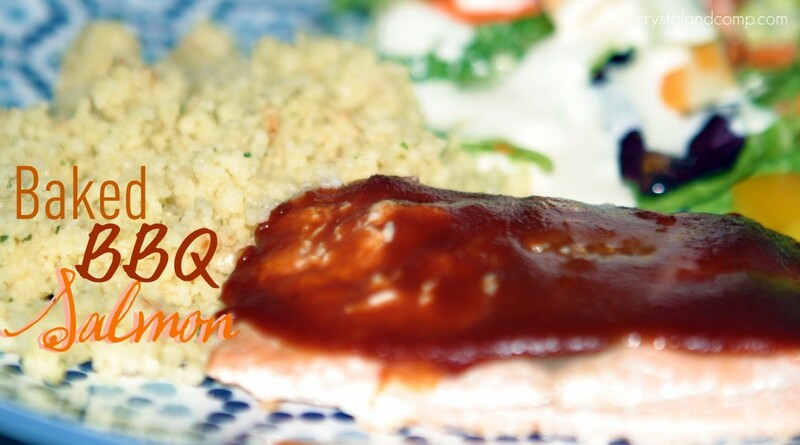 BBQ salmon sounds delicious and I’ve never even thought to do anything but salt and pepper salmon. My first time stopping by. Love your website and especially like birthday ideas. We just love Salmon and your recipe looks delicious! Hope you are having a great week end and thank you so much for sharing with Full Plate Thursday.